When he was preparing for his speech for a group of local citizens and experts in the town of Mersin in South-East Turkey about how the nearby situated Akkuyu nuclear energy project is seen from a Russian perspective, member of the Russian Socio-Ecological Union – one of the oldest environmental organisations in Russia – and journalist Andrey Ozharkovsky tried to get much as possible information also directly from the side of the foreseen builder, owner and operator of the power plant, Rosatom. Without success he approached Rosatom’s Turkish daughter for the project JSC Akkuyu Nuklear for the latest version of the EIA documentation. Also requests to Rosatom itself for many documents went without response. On the basis of his own inside knowledge and whatever there is available publicly, he could, however, still sketch an insightful picture. He has studied the dynamics around the Hanhikivi project that Rosatom is pushing in Finland, the Astravetz project in Belarus. He has followed for decades the work of Rosatom in countries like Bulgaria and Hungary. He could get access to a lot of documentation published in the Russian, Turkish and international media about Akkuyu as well. Rosatom listened in. After his presentation in Mersin, it finally reacted with a 2 page densely written diatribe (see illustration): “You sent a request for the Akkuyu nuclear power plant. Before returning to this issue, we want to report the following. Turkish media Jumhuriyet published an article on May 2, 2017 on the issue of nuclear waste, which will be produced during operation of the Akkuyu nuclear power plant. The author of the material, Abidin Yagmur, quotes and refers to your speech at the panel discussion organized in the Mersin House of Physicians, where you came by the invitation of the Antinuclear Platform. 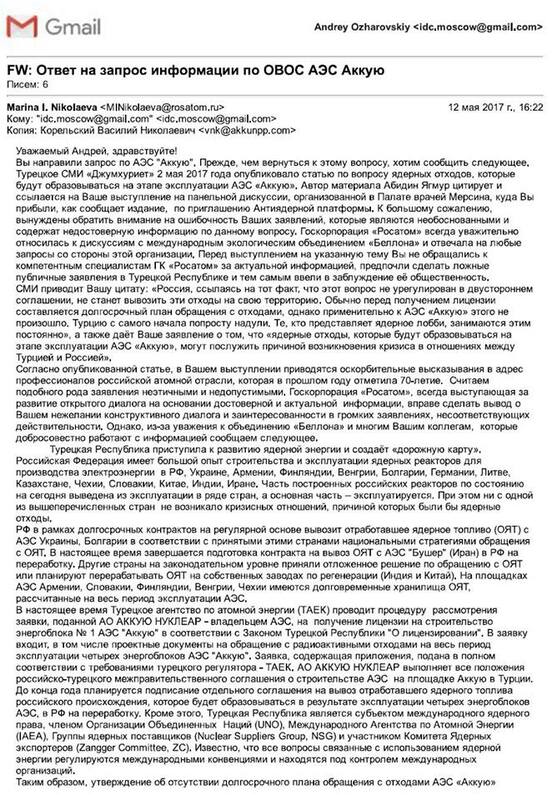 To our great regret, we are forced to pay attention to your erroneous statements, which are baseless and contain inaccurate information on this issue.” It then continues to accuse Ozharkovsky of not having asked Rosatom experts for up to date information, of making false public statements and misleading the public. Well, that is a wrong conclusion, because Ozharkovsky had made clear that also Russia has no final disposal for radioactive waste, nor is there one for the foreseeable future in Turkey. And it is that lack of clarity and confusion of short term management with final solution that could, according to Ozharkovksy, lead to future tension between the countries. That attitude towards transparency does not bode well for cooperation between Rosatom and citizens in European countries where it wants to be active, including Turkey. A justification discussion including the environmental, social and economic risks of new nuclear projects cannot be based on PR talk and has to include a well informed public. That needs openness to requests for information from the public, and most certainly from informed NGOs and their members. It needs openness to discuss those issues without intimidation. And above all, it needs honesty about the facts and uncertainties and true, not only formal respect for these citizens. ILLUSTRATION: download Rosatom letter translated in english here. See the scan of the russian version here. The Espoo Convention Implementation Committee asks the UK to suspend work on the Hinkley Point C nuclear power station because of the government’s failure to consult with European countries. Last year, the Espoo Convention Implementation Committee concluded that the UK had failed to meet its obligations under the Espoo Convention to discuss the possible impact of an accident at Hinkley on neighboring countries. The Implementation Committee has now gone a step further and said the UK should consider refraining from further works on the site of the new reactors until an transboundary environmental impact assessment as been conducted. The UK followed the Committee’s suggestion to send out a notification of the project to potentially impacted countries. It even went the extra mile and notified all parties to the Espoo Convention. At date, at least the Netherlands, Norway and Germany have reacted positively on the invitation to participate in a transboundary environmental impact assessment. France is preparing to update its triennial report on the implementation of the Aarhus Convention. This Convention deals with access to information, participation in decision-making and access to justice in environmental matters. The application of the Convention notably concerns the nuclear sector. Following the request of the Ministry of the Environment, Energy and the Sea, ANCCLI wishes to share its experience and proposals with the application of the Aarhus Convention to the nuclear sector. ANCCLI recalls that free access to information is the norm and that secrecy, whether it is commercial, industrial or military, must be an exception. The appropriateness of the use of secrecy must be verifiable by an independent body. The ANCCLI considers that the difficulties encountered in determining what information can not be made public, in the absence of a clear process for determining whether information is protected by a form of confidentiality, should be mentioned in the obstacles encountered in the Implementation of Article 4 of the Aarhus Convention. ANCCLI considers that work remains to be done in the provision of information in digital format. Files submitted for consultation or public inquiry are not always available on the Internet, or in a format that does not allow for thorough work. Access to files via the Internet allows the public to study the documents without having constraint of the opening time of the customer care desk. ANCCLI considers that the provisions concerning public participation are only partially implemented in France. Local Information Commissions often lack time to work thoroughly on subjects on which they are consulted. In addition, public participation processes often arrive rather late, when the implementation of a project or important technical options have already been decided. 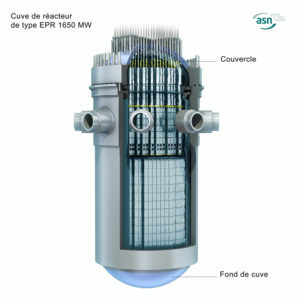 For example, EDF is currently studying the construction of new storage capacities upon request of the ASN. The operator seems to consider only the option of one or more underwater and centralized storage facilities. In fact, other options exist. It appears that public participation will only occur at the time of the application for authorization to set up the facility or facilities, when the main technical options are already predetermined. Implementation of the Aarhus Convention would involve engaging a public participation process now, helping to discuss the various options for fuel storage. The Espoo convention on Environmental Impact Assessment in a Transboundary context lays down the obligation to assess the environmental impact of activities in the nuclear sector at an early stage of decision making. It also lays down the general obligation for parties to notify and consult each other on all major projects under consideration that are likely to have a significant adverse environmental impact across national borders. The Aarhus Convention links human rights and environmental issues. The preamble of the Aarhus Convention states that: “In the field of environment, improved access to information and public participation in decision-making enhance the quality and the implementation of decisions…”. 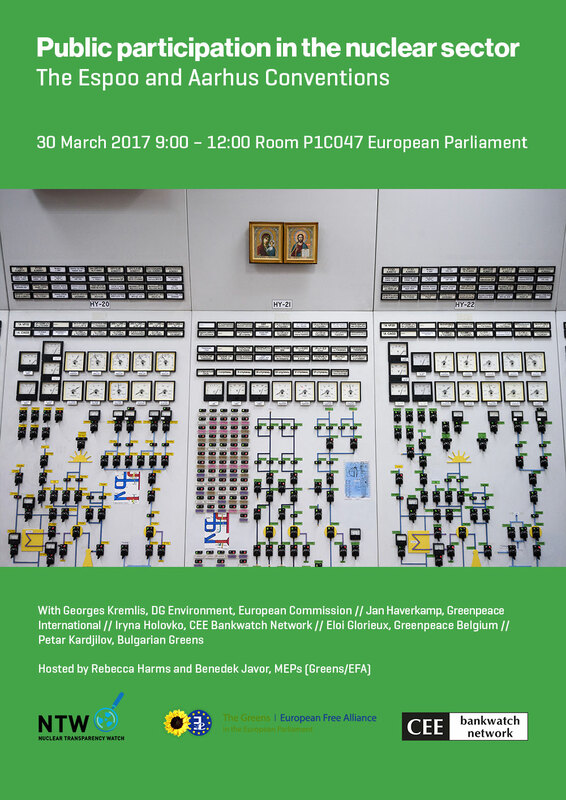 In the context of the upcoming Meeting of Parties to the Espoo Convention in June 2017, the roundtable will analyze the legal provision of the two conventions and their implementation to cases of lifetime extension of nuclear units. The presentations and discussions on the case studies aim to map the progress since the last Meeting of Parties to the Espoo Convention and draw recommendations from civil society and MEPs prior to the Meeting of Parties in June this year.